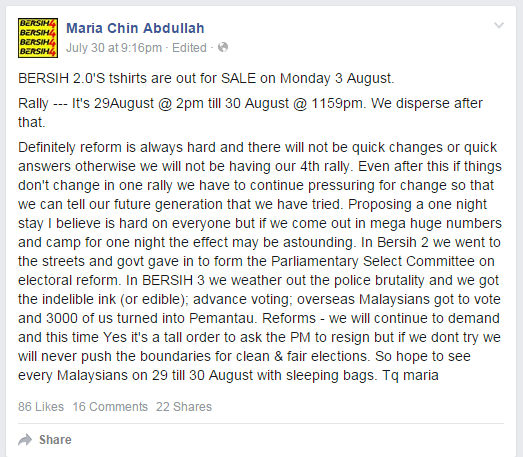 August 24, 2015 (Tony Cartalucci - LD) - Malaysia's "Berish" movement - an umbrella organization for various opposition groups opposed to the current government of Prime Minister Najib Razak - plans its fourth street demonstration in 8 years to unfold at the end of August. While Bersih's alleged goal is "clean and fair elections," it is openly led by the government's opposition headed by the now imprisoned US-proxy Anwar Ibrahim and a myriad of US-funded and directed nongovernmental organizations (NGOs). The US State Department, through its US National Endowment for Democracy (NED) and its subsidiary the National Democratic Institute (NDI), along with convicted financial criminal George Soros' Open Society Institute (OSI), have funded both Bersih directly, and many of the NGOs that constitute Bersih's core leadership. Several NGOs currenlty openly funded by the US NED - i.e. Islamic Renaissance Front and Lawyers for Liberty - can be found also listed on Bersih's current "endorsees" list. Despite years of immense US-funding, Bersih has recently pleaded for donations and now claims they've received over a half million Ringgit (over 100,000 USD). More recent reports claim the amount could be as high as 1.2 million Ringgit. "Reforms - we will continue to demand and this time Yes it's a tall order to ask the PM to resign but if we dont try we will never push the boundaries for clean & fair elections." Apparently by "clean & fair elections," Bersih's leadership means elections in which their opponents have been undermined and otherwise eliminated, and in which they can take power - or in other words, another textbook case of US-backed regime change. Image: To Berish, "clean and fair elections" means eliminating all of your opponents through a US-backed campaign of sedition and seizing power. Bersih's core leadership seeks to seize power in Malaysia from behind a facade built upon alleged reforms. It is seeking donations from the Malaysian public despite immense funding from the United States government and demonstrable support from across the West's extensive global media network. It is difficult to discern how a movement built on lies, fraud, thievery, and sedition represents a step forward for Malaysia which might explain why, after three previous staged demonstrations, those behind Bersih have yet to succeed in their true goal of overthrowing the current political order. Malaysia's Bersih movement is yet another example of so-called American "soft power" in action. The use of US-organized and funded street mobs to carry out political destabilization and regime change has likewise transpired in similar fashion in Thailand through the use of US-backed Thaksin Shinawatra and his "red shirt" street mobs, and in Myanmar with Aung San Suu Kyi and her legions of anti-Rohingya, violent "saffron monks." The goal is to string together a united front across all of Asia with which to encircle and contain China's rise. 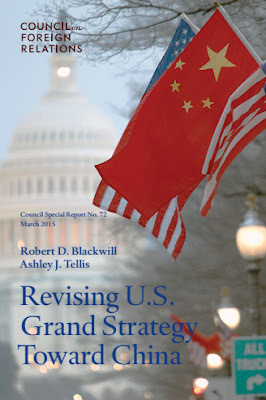 US policy papers openly admit this, with the most recent published by the Council on Foreign Relations (CFR) declaring America's goal in Asia is to maintain primacy over all other nations - especially China. Because the American effort to 'integrate' China into the liberal international order has now generated new threats to U.S. primacy in Asia—and could result in a consequential challenge to American power globally—Washington needs a new grand strategy toward China that centers on balancing the rise of Chinese power rather than continuing to assist its ascendancy. The report admits that China's rise will benefit the Chinese people, their regional neighbors, and bring stability along China's peripheries - and also admits this must be stopped in order to maintain US "primacy in Asia." ...[the TPP will be] a vivid demonstration that the United States is determined to compete on the Asian economic playing field. By the same token, U.S. grand strategy toward China will be seriously weakened without delivering on the TPP. It is no wonder the "pivot toward Asia" has stumbled, where every option facing America's "allies" or potential "allies" include unattractive compromises made simply to bolster US hegemony. Regional leaders genuinely interested in their respective nation's best interests have attempted to walk a tightrope between provoking the US and forgoing the obvious benefits of doing business with China. Malaysia, who has jailed US-proxy Anwar Ibrahim and has resisted or ignored attempts by the US to coerce Malaysian foreign and domestic policy, in particular has suffered recently a rash of suspicious incidents, including the lost of 3 passenger airliners in a single year, including MH370 lost mysteriously while en route to China, MH17 shot down during NATO's proxy war in Ukraine, and an AirAsia plane crash which claimed 162 lives. Three airline disasters involving Malaysian-affiliated carriers in less than a year have dented confidence in the country's aviation industry and spooked travelers across the region. Other nations resisting US attempts to install client regimes include Thailand, which recently suffered the worst terrorist attack in Bangkok in recent memory, with 20 killed and over 100 injured in a bombing almost identical to smaller incidents carried out by supporters of US-backed, ousted dictator Thaksin Shinawatra. It appears the much vaunted US "pivot to Asia" has disintegrated into a brawl where violence, terrorism, and street mobs bent on regime change have taken the place of the US' initially optimistic, positive, if not entirely disingenuous rapprochement to the region.